S77 treadmill has the power of a club quality treadmill. No need to join a club, the S77 treadmill gives you everything in the comfort of your own home. It's even rated for users up to 400 lbs.When in heart-rate training mode, the treadmill automatically makes adjustments to the incline to keep you in your target heart-rate zone. The S77 treadmill has all the same great features as the S73 treadmill and adds a 3.5 Cont. Duty HP motor and also incorporates the largest deck that SOLE offers, an exceptional 22" wide running surface that is comfortable for any runner. These powerful additions make the S77 treadmill quite a fitness package. The treadmill motor carries a full 30-year warranty, with a lifetime warranty on the deck and frame. ToughTrain 3.5 out of 5 Can be recommended. You won't regreat this deal. TreadmillDoctor.com 7.35 out of 10 With the upgrades to the S77 this year, this one is now at the top of the pack again for Sole. *Note: Most of the sites, stores or shopping portals listed above sell Sole S77 Treadmill with discounts and other exciting offers. There is a possibility that the some of above websites are not selling Sole S77 Treadmill now. Toughtrain.com is not liable for such cases or instances. 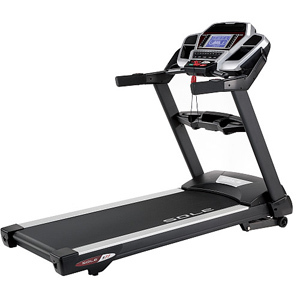 Also we do not recommend any seller for Sole S77 Treadmill and a buyer should buy from where he/she gets best deal with quality of products, service and on time delivery (shipment).